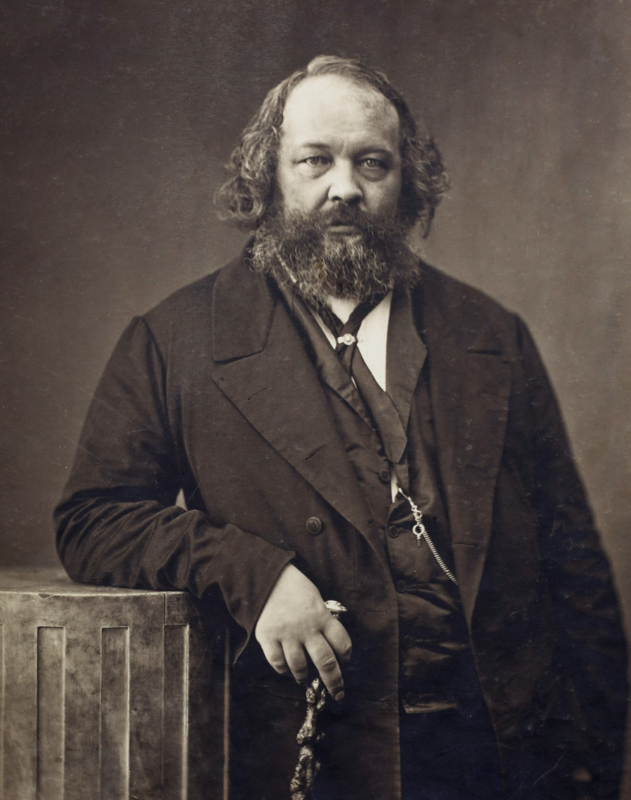 A short biography of Russian anarchist, often described as the founding father of collectivist anarchism, Mikhail Bakunin. Born May 18 (May 30 OS), 1814 Pryamukhino, Russia – died June 13, 1876 Bern, Switzerland. His passionate campaigning for democracy and anti-colonialism made him 'public enemy number one' in the eyes of most European monarchies. In 1848 he was expelled from France for making a speech in support of independence for Poland. His passion for liberty and equality, and his condemnations of privilege and injustice gave him an enormous appeal in the radical movement of the day. In 1868 he joined the International Working Men's Association (also known as the First International), a federation of radical and trade union organisations with sections in most European countries. Very rapidly his ideas developed and he became a famous exponent of anarchism. 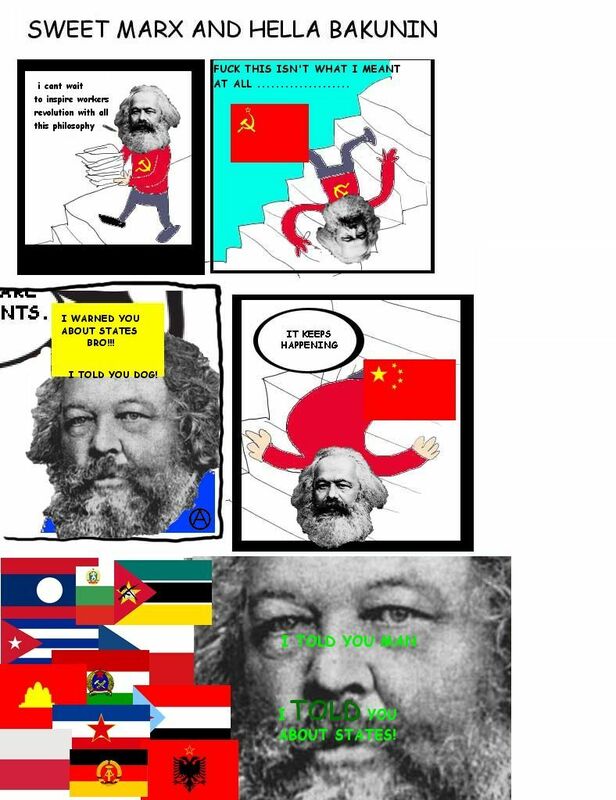 While agreeing with much of Marx's economic theory, he rejected his authoritarian politics and the major division within the International was between the anarchists and the Marxists. A committee set up to investigate the charges found, by a majority, Bakunin guilty and voted to expel him. The Swiss section called a further congress, where the charges were found to be false. An international conference also vindicated Bakunin, and went on to adopt the anarchist position of rejecting any rule by a minority. His legacy is enormous. Although he wrote manifestos, articles and books he never finished a single sizable work. Being primarily an activist he would stop, sometimes literally in mid-sentence, to play his part in struggles, strikes and rebellions. What he left to posterity is a collection of fragments. Even so, his writings are full of insights that are as relevant today as they were in his time. While understanding that ideas and intellectuals have an important role to play in the revolution, a role of education and articulating people’s needs and desires, he issued a warning. He cautioned them against trying to take power and create a dictatorship of the proletariat. The notion that a small group of people, no matter how well meaning, could execute a coup d'etat for the benefit of the majority was a heresy against common sense. Long before the Russian revolution he warned that a new class of intellectuals and semi-intellectuals might seek to step into the shoes of the landlords and bosses, and deny working people their freedom. In 1873 he foretold, with great accuracy, that under the dictatorship of the proletariat of the Marxists the party leaders would concentrate the reins of government in a strong hand and divide the masses into two great armies - industrial and agricultural - under the direct command of state engineers who will constitute a new privileged scientific and political class. Bakunin understood that government is the means by which a minority rules. In so far as 'political power' means the concentration of authority in a few hands, he declared, it must be abolished. Instead there must be a 'social revolution' which will change the relationship between people and place power in the hands of the masses through their own federation of voluntary organisations. Freedom without socialism is privilege and injustice; socialism without freedom is slavery and brutality. Prof. John Keane said that whilst in a Saxon prison in 1849 Bakunin got through 1600 cigars! Maybe Wagner got a crate of them for Mikhail?